Our family loves Spinach! There were days when our LO would eat only spinach! When he was about ten months old, everyday I would cook spinach with powdered black pepper and salt, mix it with rice and ghee and feed him!! Now at 23 months, he eats almost all veggies and still spinach is his favorite. I have seen lots of kids loving spinach. But yes many don’t like it too. My advice to new moms is introduce variety of food – all kinds of veggies and fruits in your LO’s diet. Next in line is the Spinach Rice recipe. This is yet another simple single pot meal. Wash, clean and chop spinach. Heat oil and temper cumin seeds, cinnamon, green chillies, cloves, ginger and garlic. Add Onions and sauté till they turn transparent. Add potatoes, salt, pepper powder and garam masala fry till potatoes are cooked. Then add spinach and cook for 3-4 minutes. Add cooked rice with spinach and mix thoroughly. 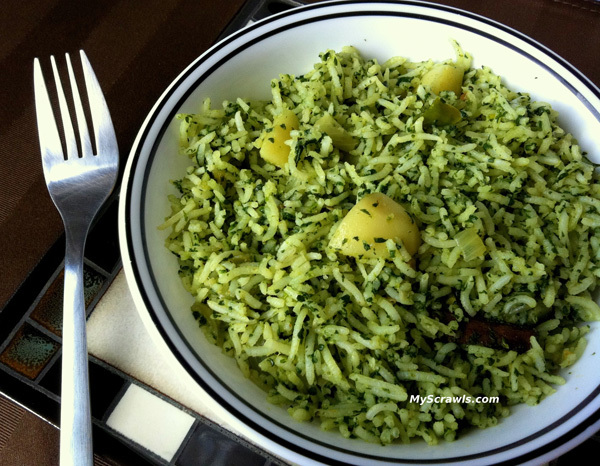 NOTE: Use basmati or any long grain rice for making Spinach Rice recipe. Wondering how to cook rice such that the grains stand separate? How much water to add to rice to pressure cook it? 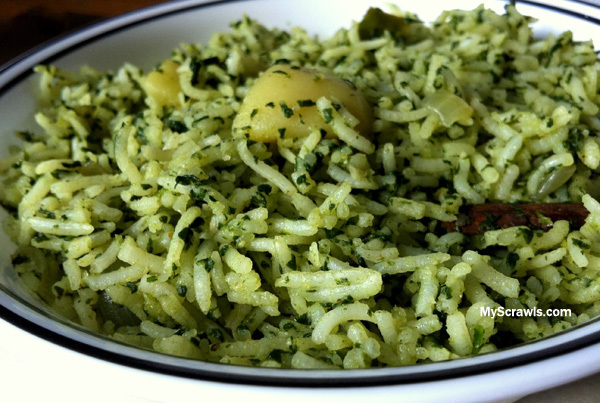 Click here for tips to cook rice for making perfect Spinach Rice recipe!